Cat has no idea what he wants — until it’s right in front of him. Cat is very hungry. But cat food is dry and dull and not at all yummy. So what in the world should Cat eat instead? Turtle eats worms, but worms are too wiggly. Fox eats rabbits, but rabbits are too bouncy. What everyone else loves to eat is thoroughly unappetizing to Cat. Until, by chance, the thing Cat really wants to eat appears right in front of him. What could it be? Christopher Silas Neal’s retro-style illustrations and easy-to-follow story are the perfect match for even the pickiest eaters — and the patient souls that feed them. Christopher Silas Neal is the illustrator of Over and Under the Snow and Up in the Garden and Down in the Dirt, both written by Kate Messner, and is a regular contributor to the New York Times. He is also the author-illustrator of Everyone. Christopher Silas Neal lives in Brooklyn, New York. Throughout, mixed-media illustrations are eye-catching and expressive with bold, large forms set against spare backgrounds, making the book a sure bet for storytime success with large groups. You will read this (and reread it, too). 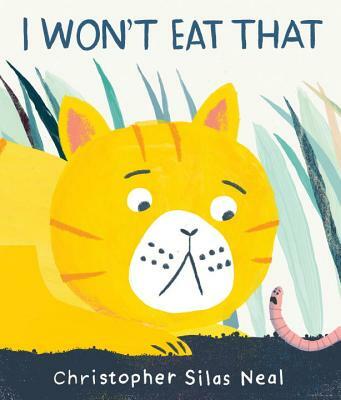 Neal’s animals, painted in milky colors, have a folktale look suited to the story’s traditional question-and-answer form and use of repetition...Though the mouse escapes, the biggest surprise is the cat’s transformation from idle observer into glittery-eyed predator. Perhaps that’s the story’s lesson—the right choice is the one that instantly focuses our attention. The clear and uncluttered illustrations, combined with a brief text consisting entirely of dialogue, make this ideal for sharing with various-sized audiences. However, be ready for conversations about the open ending and the culinary and predatory habits of specific animals. The large illustrations make this a natural choice for storytime. Youngsters will love repeating Cat’s question to each animal and joining the feline in its cumulative list of objections. Requests for repeated readings are inevitable.